The Walk/Run/Roll in Lauren's Shoes will be held on Saturday, June 18 2016! Race gun start: 11:00 a.m.
Party in the Grove: 10:00 a.m-4:30 p.m.
Race award presentation: 12:30 p.m.
First 300 registrants will receive a technical T-shirt and Tony Walker race bag with goodies inside. Click on the images below to see our invitation letter and sponsorship form. 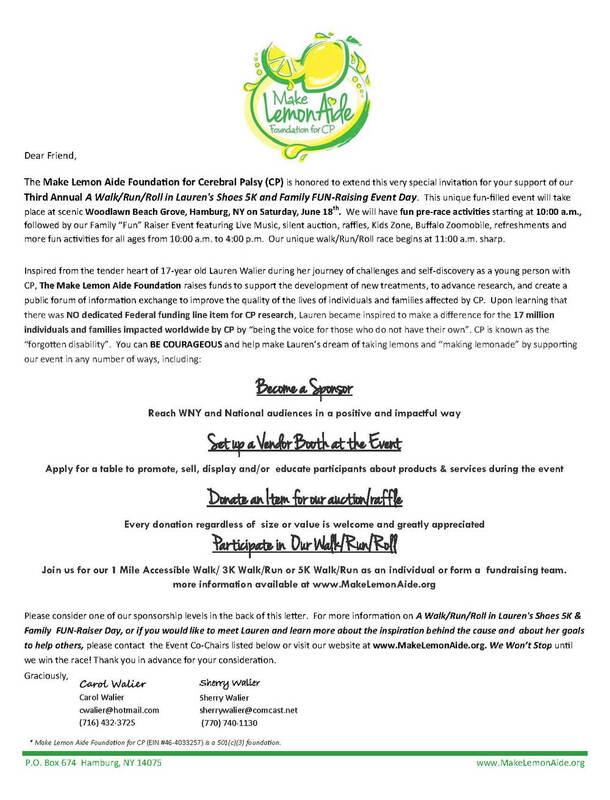 Or click here for a PDF of the invitation letter and sponsorship form. Walk/Run/Roll in Lauren's Shoes 5K is part of the Hamburg Racing Series. Raising funds at our first annual Walk in Lauren's Shoes 3k!